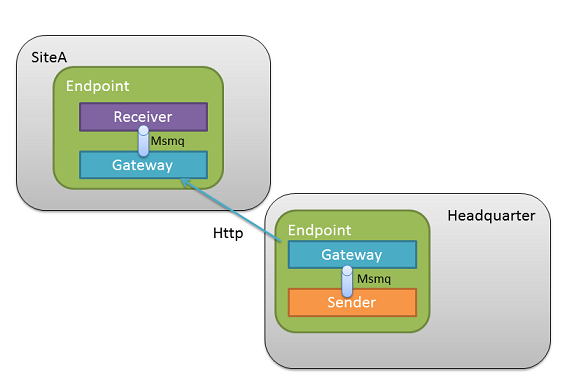 The purpose of the gateway is to provide durable fire-and-forget messaging with NServiceBus across physically separated sites. Note that "sites" in this context mean distinct physical locations run using IT infrastructure, not web sites. The gateway should be used only for logically different sites and use explicit messages for cross-site communication. It provides automatic de-duplication and retries; however, the publish-subscribe pattern is not supported. It is useful for communicating when using regular queued transports for communication is not possible, for example when setting up a VPN connection is prevented because of security concerns, bandwidth limitations, latency problems, high availability constraints, etc. The gateway should not be used as a disaster recovery mechanism between sites. In this scenario, all sites are expected to be exact replicas. From a logical perspective they're a single application, replicated in multiple locations. In this situation it is recommended to use the existing support infrastructure to keep all sites synchronized. Transport level encryption with SSL. Creation of additional channel types. Listening to multiple channels of different types. Sites are logically different when each site differs in behavior from others. In fact, they might also serve a completely different business purposes. One example is a chain of retail stores. The prices of products are specified by people working in headquarters. All the stores in the chain need to know the prices in order to function. Also all stores send sales reports to headquarters in order to provide them with information for adjusting prices. The prices have to remain effective for a minimum of one day, so it is sufficient for the headquarters to push the price updates to the sites only once per day. Headquarters - Maintains the prices and pushes price updates to the different stores on a daily basis. Store - Stores the prices locally for read-only purposes, sends sales reports to the headquarters. The price updates for stores can be modeled as a DailyPriceUpdatesMessage message type containing the list of price updates for the coming business day. In this scenario each site needs to receive only one update message per day. Sending messages across sites has very different transport characteristics than sending them within a given site. For example, latency will typically be higher, and bandwidth and reliability will be lower. Therefore only dedicated message types should be used for gateway communication in order to explicitly inform developers when they're about to make a cross-site call. SendToSites accepts a list of sites to which it should send messages. Note that each site can be configured with a different transport mechanism. In NServiceBus version 5 and above, the gateway is provided by the NServiceBus.Gateway NuGet package. In version 4 and below the gateway is part of the NServiceBus NuGet package. The gateway requires NServiceBus persistence to operate though not all persisters support it. Currently, the gateway is supported only by InMemory, RavenDB and NHibernate persisters. If the configured persister doesn't support gateway, an exception will be thrown at endpoint startup. The provided example shows the built-in default retry policy. Custom retry policies should eventually give up retrying, otherwise the message could get stuck in a loop being retried forever. To discontinue retries return TimeSpan.MinValue from the custom retry policy. The message will be then be handled by recoverability. The recoverability mechanism built into the Gateway does not roll back the receive transaction or any ambient transactions when sending a message to another site fails. Any custom recoverability policy cannot rely on an ambient transaction being rolled back. When retries are disabled, any messages that fail to be sent to another site will be immediately routed to the configured error queue. The gateway component ensures only forward compatibility for one major version. That means a message sent by the NServiceBus 3.x Gateway can be understood by the NServiceBus 4.x Gateway, and a message sent by the NServiceBus 4.x Gateway can be understood by NServiceBus.Gateway 1.x (the Gateway package targeting NServiceBus 5.x). However, a message sent by the NServiceBus 3.x Gateway will not be understood by NServiceBus.Gateway 1.x (NServiceBus 5.x) as this skips a major version. Likewise, a message sent by NServiceBus.Gateway 2.x will not be understood by NServiceBus.Gateway 1.x, as backwards communication is not supported. Alternative HTTP Channel implementation with less use of HTTP Headers. How to handle multi-site communication. How to solve common issues that arise with the gateway.